Baggy jeans that didn't make my booty look hideous. 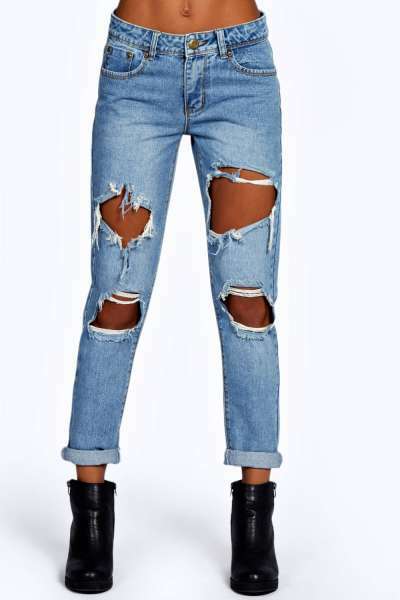 Baggy jeans that didn't make my booty look hideous and ALSO didn't cost tons. Those were my requirements while on my quest for the perfect pair of baggy jeans. I didn't have to look much further than Forever21 for mine..Please due go down a size if you buy this pair as these stretched up at least a size. They were under $30 too! 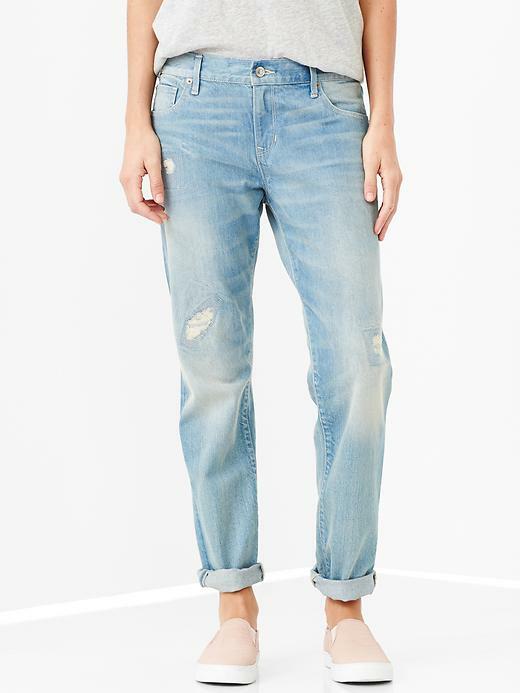 The pair below are from Gap.com. I love how baggy they are! Also, they are $30!! Thanks for reading and stay comfy in whatever pair you decide! Posted on October 15, 2014 by Rax Clothing. We are mad for plaid! Yesss, mad!! There is just something so classic and happy about plaid. It will always remind me of back to school shopping, cozy sheets, and my 90s crushes. Here are a few of our favorites in our shop. The classic flannel.. Pair it with.. Feeling a bit more fancy, try this beauty..Pair it with.. Okay, so if dresses and flannels aren't your thing ;) you could always sport a plaid skirt..Pairs well with..
Whatever you decide to wear, remember to stay warm and cozy! Cheers! Posted on October 8, 2014 by Rax Clothing. Built in 1971 the counter tops screamed 70s! Each of the walls were filled with old license plates and pictures! Sitting on the bar tops were old fortune teller dispensers which were awesome! A penny for a fortune!! Yes 1 cent!! suggested questions you could ask were "Should I take a vacation?" "Is my future bright?" "Will I make money this year?" etc. When you pulled the lever down a little receipt would come out with your fortune. Imagine if you could find out true answers with only a penny! So great! When entering we found more than just coffee. Way station coffee shop offers all day breakfast and brunch options. Sadly, Gina and I weren't able to eat but this place is definitely worth the stop for the decor alone! To view menu. Posted on October 7, 2014 by Rax Clothing. Today I'm sharing a sweet, cut to the chase DIY project. It's perfect for a last minute gift or to do in front of the TV while watching Harry Potter<----that's what I did! Let's start with gathering your tools..
1. Plain, flat top, bottle stopper. Found here. 2. White paint and a paint brush. Try this paint. 4. An assortment of mini rocks and crystals. Etsy has lots of crystals and rocks. This project almost needs no instructions it's so simple! The first step is painting your cork, I went ahead and put on two coats to make it nice and solid. You can use any color you would like, but I chose white. 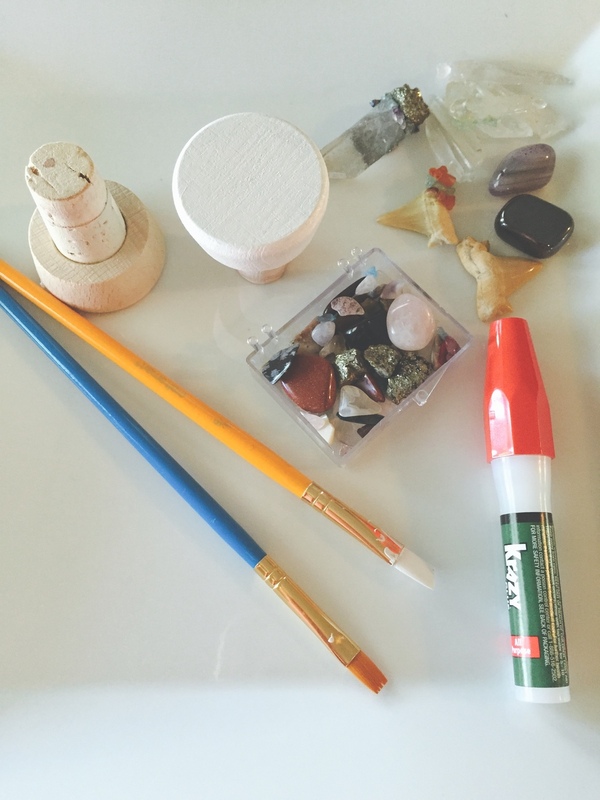 Once your paint is dry add a drop of super glue to the center and apply your largest piece, that way the rest is just filling in empty spaces with your other rocks/stones. I used a pair of tweezers to get into all the little nooks and crannies that the stones leave around each other. My last step is usually applying extra glue to any loose stones. VOILA!! That's it! Finished, done, complete!!! Hopefully you have fun with this, now time to pop a bottle and use that new cork! ;) ;) Cheers! P.S! Post your results on Instagram under #raxclothing, we would love to see them! Posted on October 6, 2014 by Rax Clothing. Nicole here!!! Its been several years now that I've gone the extra mile to eat, fresh, healthy meals. Believe me NOT always!...ask anyone that knows me well and they will tell you I love, I mean LOVE sugar! In my perfect calorie free world I would eat sugar for breakfast, lunch, all recommended daily snacks, and dinner! lol I will share some of my favorites in future posts! Promise! Today I wanted to share one of my healthier recipes, STUFFED TURKEY (or quinoa for all the vegetarians out there!) BELL PEPPERS! Enjoy! Cut all veggies prior to cooking. All the ingredients cook quickly so if your not prepped you could overcook your dish. Warning this part smells soooo yummy! Place cheese at the base of each pepper before adding mixture. Heat oil saucepan over medium heat. Saute onion, celery, and jalapeno for about 5 minutes, until soft, then add garlic and cook for an additional minute. Stir in tomatoes and cook for 5 minutes until most of the liquid is evaporated. Add zucchini. Stir in black beans, (if using quinoa), and 1/4 cups water. Cover and bring to a boil. Reduce heat to medium-low and simmer for about 20 minutes or until quinoa is ready. In a separate medium saucepan heat olive oil, add turkey, and season with garlic salt and pepper. Remove turkey from heat when almost fully cooked. Add turkey to mixture, stir in feta cheese, and add cilantro. Preheat over to 350 degrees F pour reserved liquid from tomatoes in the bottom of your baking dish. Fill bottom of peppers with a pinch of grated cheese, then mixture and place in baking dish. Bake for 25 to 30 minutes. 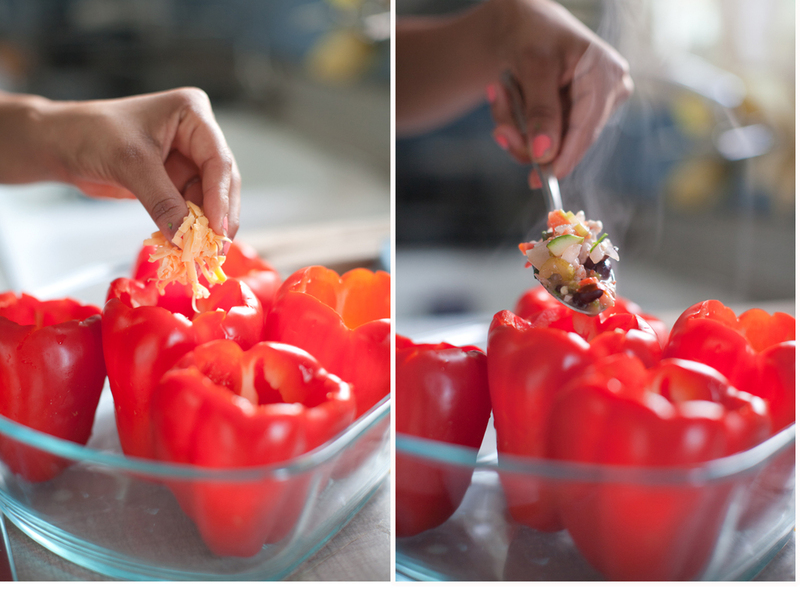 If desired take peppers out 10 minutes before done and top off with additional grated cheese! I love cheese so I stack it on! ENJOY! oh and don't forget your cerveza! Posted on October 3, 2014 by Rax Clothing. Yesterday I journeyed down the road to Ventura, where Nicole and her family recently moved. The main point of the trip was to shoot some product for our website AND to visit her new place. She moved into a beautiful little home from the 60s or 70s complete with beautiful wood floors and a nice big back yard for her pup, Annie, to run around in. Since yesterday we spent all day shooting goodies for our shop, we decided today was to be spent a little differently. We began the morning with coffee and a simple avocado on toast breakfast that, although simple, was amazing. After filling up on toast we decided that we would pay the farmers market a visit before heading into town to thrift..
After browsing and sampling some goodies we headed home to get ready and then out to begin our day thrifting. It's really nice going with a partner..you cover more ground that way, and see things that each other might have missed. UUUMMMM how good is that sign??! I saw this little beacon of light.. ;) from across the store and swooped it up before anybody else had the chance! We are servicing it and adding it to the shop soon. Another find were these little overalls. They are so perfect and slouchy, I had to turn them into my outfit of the day. Similar styles available in our vintage shop section. I also need to give this hat a rest....but my roots are too bad ;D Cheers! Posted on September 24, 2014 by Rax Clothing. Today is the first day of fall, so I decided to wear plaid. It really seemed appropriate..While the calender says fall, the weather says 100 degrees summer heat... I'll be waiting patiently, of course while watching Hocus Pocus, for the day I can wear something a bit more cozy. Cheers! Posted on September 22, 2014 by Rax Clothing. Here are a few of our favorite vintage pieces in our shop right now. This little vintage 70s dress is a perfect addition to any spring/summer wardrobe. Wear it to sip champagne with your buddies or to visit the boardwalk. Platforms and a floppy hat make lovely additions to the outfit. How cute, how cute, how cute? 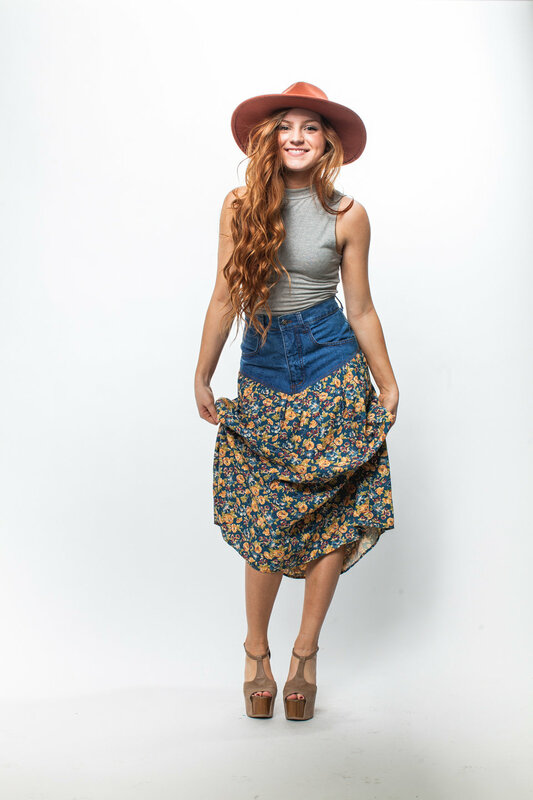 Logan looks great in this 90s high waist skirt. Flowers and denim...what more could ask for? We have it paired with a crop top but it would also look great with a perfectly worn graphic band tee. Last but not least are these vintage Ditto's bell bottoms. Not only comfortable but quite flattering around the booty area. They have spandex so that can definitely move and groove. Paired with band tees, crop tops, long tops, short tops-pretty much any top they look great. Visit our SHOPVINTAGE section to buy these goodies. Cheers! Posted on February 19, 2014 by Rax Clothing. We all know how Mondays sit with most people, but over here at Rax Clothing we don't really mind them. We usually like to begin the week going over some of our favorite pieces we have in our shop and putting together dreamy outfit ideas. This first piece is such a beautiful suede, high-waist, midi skirt. Midi skirts drive me wild(Gina) and suede midi skirts from the 70s drive me even wilder! Beside crop tops, this little beauty would look perfect with a grungy worn band tee. Next up is this little dress of perfection. The colors, pattern, materials, and cut are all drool worthy. This little number just so happens to be one of Nicole and mine favorite pieces we've ever had. You can almost still picture the previous owner spinning away with Stevie Nicks belting out "Rhiannon" in the back ground. Just throw on a kimono or velvety fringe wrap to complete the look. Last but definitely not least is this perfect vintage top from Mexico. It's the sweetest thing even and pair perfectly with bells, cutoffs, and just about anything else. Since Spring and Summer are right around the corner, we say start stockin' up on brightly colored pieces now! Posted on February 3, 2014 by Rax Clothing. Good morning! We have decided to do a "Sweet little things" post once a week. A fun little post showcasing the things we are currently sweet on. Let's start with this little gem of a bag, so perfectly beaded and a beautiful addition to any purse! 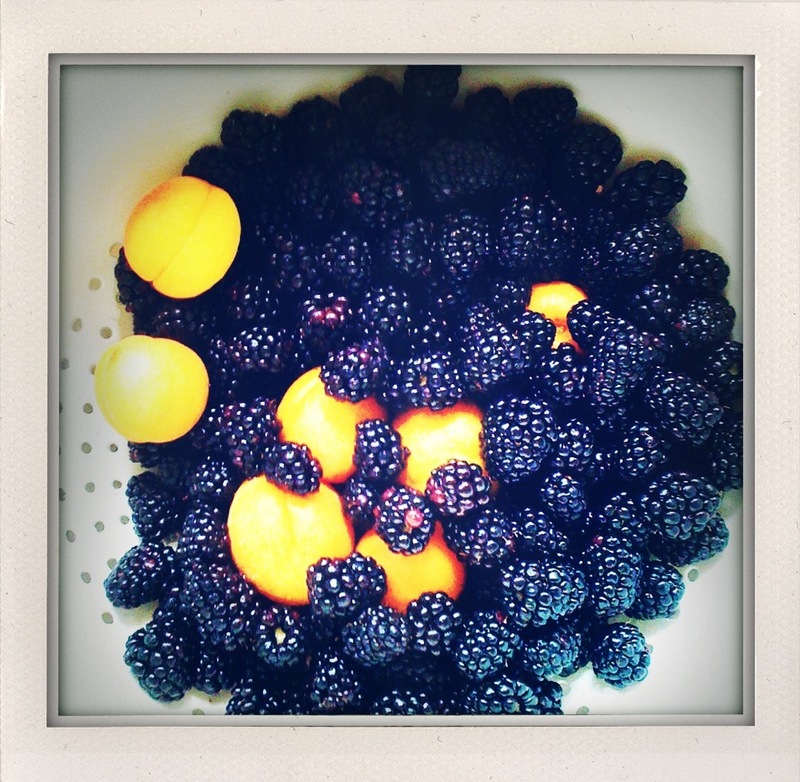 A sweet berry mid-morning snack..
Hope you have a wonderful week filled with lots of sweet little things! Cheers! Posted on January 29, 2014 by Rax Clothing. Nicole and I decided that we needed a mini escape. Nothing too far away but just far enough to clear our minds and re-evaluate the simple things. We chose the desert right outside of our city and started with a little place called Charlie Browns. Charlie Browns is pretty amazing. It's a toy store, unique gift shop, dinosaur land, retro candy land, restaurant, coffee shop, dessert shop, and locally grown farmers market. You can spend hours in there and that's exactly what we did. Per usual I was hungry so that's where we started. Look at that thing! Nicole's turkey sandwich blew my rice bowl out of the water. I don't even eat meat but, it looked amazing. My rice bowl was....okay. Next up was shopping and exploring. I bought incense, an incense burner, a tea infuser, and some chocolate. Banana split and fresh mini donuts..could have gone without the donuts to be honest :/ We continued our journey a couple miles up the dusty road and stumbled upon The Outpost. It's filled with beautiful turquoise and silver jewelry, leather bags, moccasins, wolf print shirts, beautiful art, and blankets. The coolest thing about this place is not what's for sale but instead the man who owns it. He is a bonafide treasure hunter. 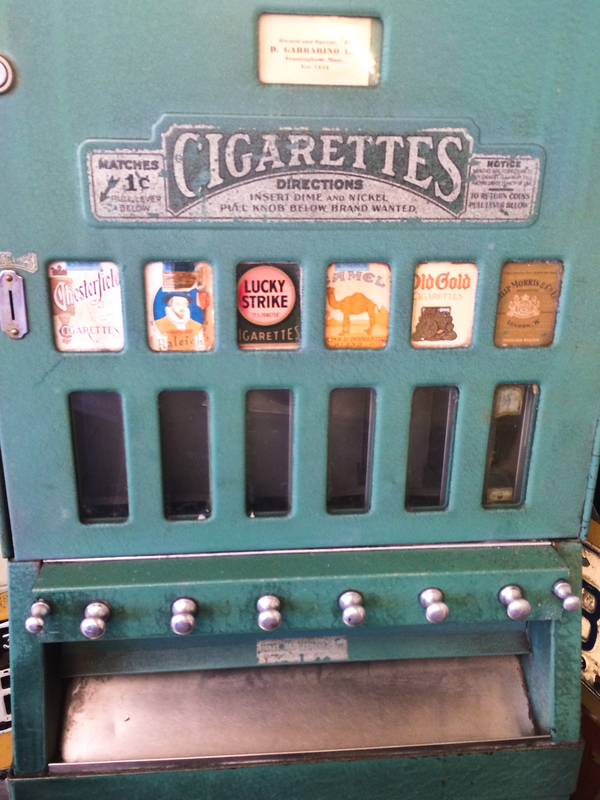 I'm talking cabinets full of stuff he has found over the years..old toys, jewelry, and coins over 130 years old. We strongly recommend paying him a visit. That's Scott the treasure hunter! As the sun was setting we pulled off the road and took some photos. The desert really is a beautiful place, especially when the sun turns everything a shimmering shade of gold. By the end of the day we were feeling calm, refreshed, and somewhat silly. It was a beautiful time and an adventure we recommend each of you to take. Cheers to next time! Posted on January 25, 2014 by Rax Clothing. Sometimes even the most fashion crazed have days where they don't feel like trying much. Days where the simple act of dressing seems like work. Today was one of those days for me. My answer to that is usually all black. All black pants, black loose tank, and all black boots. On my way out the door I'll throw on my trusty rings, a beanie, and something to fend off the cold, which brings me to this animal print blazer that I found for $14.99 at Forever21! Cheers to comfy and quick dressing. Posted on January 23, 2014 by Rax Clothing.